This is such a wonderful Fall recipe. Apples are everywhere, they're inexpensive, crisp and delicious. You can use any variety of apples for this. They don't have to be fancy. They can even be imperfect and discounted for all we care. Get the cheapest ones for cider. Your house will smell like the most luscious Fall candle on the planet. 1/2 cup honey plus more to taste (we used 3/4 cup total). Roughly chop your apples. We used our awesome apple slicer which cored and sliced them easily. No need to peel apples. Place them in a large soup pot. Slice your orange and add it to the pot, again, no need to peel the skin. Add spices: 3-4 cinnamon sticks, 1 whole nutmeg, 1 Tbsp whole cloves. Drizzle the top with honey, then pour in 11 cups water to cover your fruit. Note: If your pot doesn't fit 11 cups water, you can add remaining water in later. Your mixture will just be more concentrated and you can dilute it down with more boiling hot water after it's finished. Bring the pot to a boil over high heat (now lean over and savor this amazing aroma; it'll make your head spin), then reduce heat to medium and lightly boil uncovered for 1 hour. Reduce heat to medium/low, cover and simmer another 2 hours. The juice should begin to turn amber in color when it's finished. Add more honey and hot water to taste. The flavor should be sweet and spicy. Strain your cider through a fine mesh colander or through a cheese cloth placed over a regular colander. Squeeze out as much juice as you can and discard the fruit pulp and spices. Serve hot. 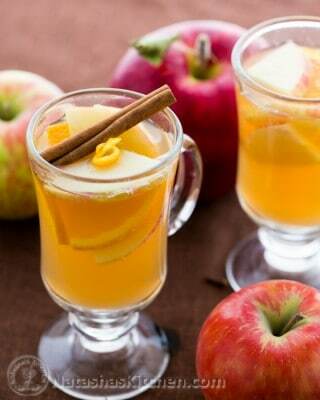 This apple cider refrigerates well and is really easy to re-heat on the stove top or in the microwave.